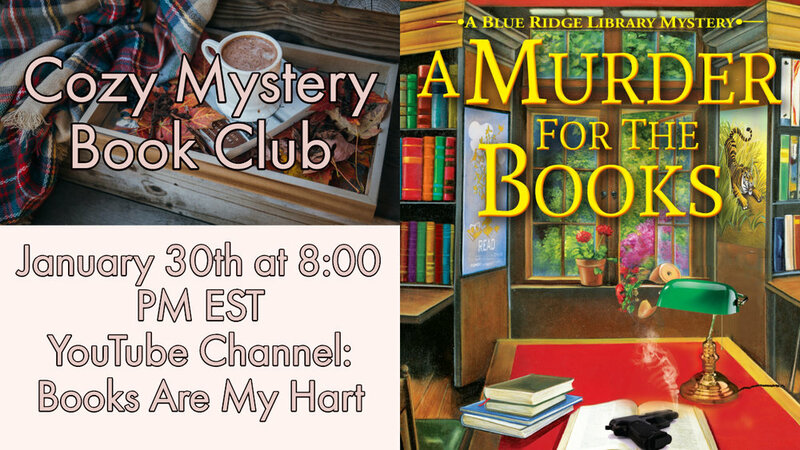 This month Courtny and myself will be discussing A Murder for the Books (Blue Ridge Library Mysteries #1) by Victoria Gilbert. Fleeing a disastrous love affair, university librarian Amy Webber moves in with her aunt in a quiet, historic mountain town in Virginia. She quickly busies herself with managing a charming public library that requires all her attention with its severe lack of funds and overabundance of eccentric patrons. The last thing she needs is a new, available neighbor whose charm lures her into trouble. Dancer-turned-teacher and choreographer Richard Muir inherited the farmhouse next door from his great-uncle, Paul Dassin. But town folklore claims the house’s original owner was poisoned by his wife, who was an outsider. It quickly became water under the bridge, until she vanished after her sensational 1925 murder trial. Determined to clear the name of the woman his great-uncle loved, Richard implores Amy to help him investigate the case. Amy is skeptical until their research raises questions about the culpability of the town’s leading families... including her own. When inexplicable murders plunge the quiet town into chaos, Amy and Richard must crack open the books to reveal a cruel conspiracy and lay a turbulent past to rest in A Murder for the Books, the first installment of Victoria Gilbert’s Blue Ridge Library mysteries. Be sure to join us for the cozy mystery fun!